For complete shower replacement services in Richmond, Virginia, or any nearby community, there is no better company to trust than MR. FIX-IT™. Our factory-trained and highly experienced team can complete virtually any type of shower remodeling work, whether you’re looking to convert a bathtub into a shower or replace an existing shower with a new enclosure. 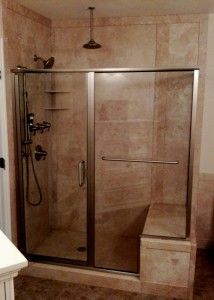 We pride ourselves on getting the job done right, which means completing a ground-up remodel to ensure that none of the issues that were present in your former shower continue into your new one. Our dedication to providing only the very best shower replacement services has helped us earn the trust of customers throughout the community, as well as an A+ rating from the Better Business Bureau. In addition to our thorough remodeling practices, we also make sure that when you trust us for your shower replacement, you’ll receive only the best shower products on the market. All of the shower enclosures we offer are made out of nonporous acrylic, a durable material that resists mold and mildew growth and will never, warp, crack, or chip. Furthermore, our showers are coated in a Silver Shield™ antimicrobial coating that helps to repel grime and prevent bacterial growth, making the shower replacement products we install both simple to maintain and highly sanitary. To learn more about the shower replacement services we offer to homeowners in Richmond, VA, and neighboring communities, contact MR. FIX-IT™ today.